With the “Divide” tool, we can split a line or a closed figure in ‘N’ equal parts. To divide do not intend to break up; lines, or figures will remain entire, but there will be drawn on “points” such as those described previously. These points, as such, will be represented by point style setting. 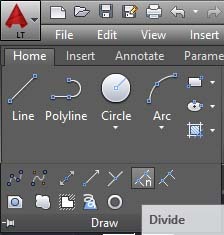 While with old AutoCAD, should enable it manually by typing “divide” on the keyboard and then pressing Enter. We see that on the command line is written: “select object to divide”. “Enter the number of segments”, i.e. enter the number of segments for which we want to divide the object. For example, insert "4" and hit Enter, on the object will appear three points that divide the object into 4 equal parts. At this point, the command will be close automatically. If we did not see any changes, means we need to modify the settings of the “Point style”, but points will be present even if not visible and can be selected *. but instead of dividing the object into equal parts, it split where it is possible, according to a measure that we determined. To enable this feature, type “measure” on the keyboard and Enter; otherwise click on relative button on the “ribbon”. Again, we are asked to select an object and then on the command line will appear: “Specify length of segment”, that specify the length of the segment to which the object will be divided up as it will go. As you understand these two commands can be useful for drawing reference points on the objects or lines, on which we can draw lines or other figures. Dividing a circle into equal parts, we can draw on the inside decor wedges. We can divide a wall of a room plant, depending on size of floor tiles to draw, etc.